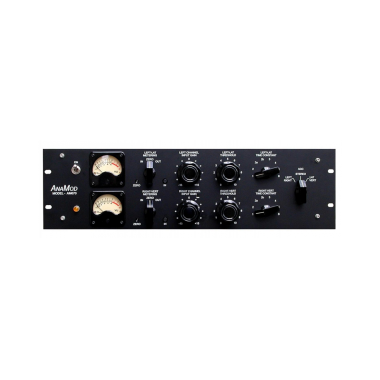 Produkte > Studio Equipment > AnaMod > AnaMod 19"
The Fairchild 670 limiter is arguably one of the most famous and sought-after stereo compressors ever made. The magical way it adds density and dimension to a track or a mix has been demonstrated on many of the best-sounding records made in the last 50 years. For buss compression, the 670 Limiter is the standard by which all others are judged. The AM670 is a faithful recreation of the classic sound and compression profile of the 670, using the AnaMod™ process to model the complex tube circuitry of the 670 and implement it entirely in the analog domain. Unlike a digital plug-in or processorbased outboard gear, there is no latency, and no A/D or D/A conversions to compromise the sound. All the functions of the original 670 have been condensed into three rack spaces. Like the Fairchild 670, the AM670 has Left/Right (dual mono), and Lat/Vert (M-S encode/decode) modes of dynamics processing. In addition, AM670 also has a Stereo mode, which links sidechains of the two channels.